Tweet: This recipe so sharp it cut my shirt! I’m not going to go all maudlin with this post…it would be easy to do so though…this type of recipe screams ‘learned at the apron strings of my dear old Granny or favourite Auntie’ its the kind of recipe that pops up with the bi-line…’the way Mum used to make it’ on chalk board menus outside awful chain-pubs, which is completely lovely…but not from my corner. Nope – I learned this dish in the fiery heat of battle……with 7 stitches in my hand and a broken finger…. What caused this deep tissue laceration and snapped digit was an argument with a fellow chef fuelled by bad cider and worse stock control ideas….a glass panel and a fire door were also involved. So with a stitched, strapped and 1/2 plastered lower arm I found myself slap bang in the middle of Saturday night service (death is about the only excuse for missing work in The Kitchen) with some idiot demanding a Shepard’s Pie…..not a item on the menu but one the owner assured the customer we could ‘spin up’. Thankfully the constituent raw parts were at arm’s length, unfortunately for me at age 19 I had never made a Shepard’s pie before…I wasn’t even sure how many or what bit of said Shepard’s would be needed. Like a commander in the trenches my head chef screamed the A,B,Cs of Shepard’s Pie construction over the heads of two chefs and a dishwasher across 20 feet of thunderous, steam heavy kitchen mayhem…I picked up about 30% of the instruction and decided to fill in the gaps…mostly with Ale. Surprisingly this is a bolt-easy dish, surprisingly I managed to crank out one perfectly formed crispy unctuous Pie, surprisingly I didn’t follow it out of the kitchen and beat the customer to death with it………………………..
Step5: When the spuds are done drain them and run them through a potato ricer to remove any lumps and add to another deep pan. Step6: Get this pan on a low heat and add the milk and butter to the spuds and with a wooden spoon mix to a butter mash. Step7: At this point you can simply spoon the mash on top of the cooled lamb or level up and pipe it as I have done here. Step8: To cook brush the spud topping with some melted butter (optional) scatter over the Pecorino cheese and roast for about 20 minutes. The pie can be kept for a couple of days though (recommended) or oven roasted right away – serve with a killer ale, more mustard and..no broken fingers! 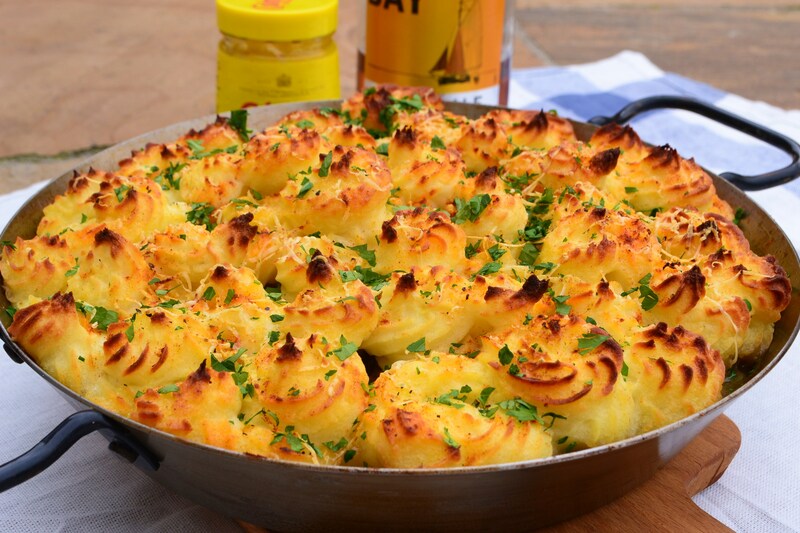 Nope definitely cheesy….check the recipe 🙂 yer bloke’s recipe sounds great….its kind of steering into Cottage Pie territory. Cottage and Shepard pies are essentially the same thing distinguished by either lamb or beef. Hot Italian sausage sound friggin magic though! I’ll bet it does – I managed to ‘import’ a huge supply mantovana Sausage during my last visit to Puglia – should have enough to get me through till Christmas! Very elegant dish and description. Contrasting beautifully with the description of the genesis. Sounds like good clean kitchen fun! Sweet mother of…… That looks all sorts of amazing! Fanx 🙂 The slightest nip in the air and am heading for the pie book!! I love the stodgier foods in Autumn! I hear allllll of that!! Thanks Mila :0) Now we’re moving into Autumn these are the dishes I loove to cook! I’ve a a fe wpie recipes coming down the line next! Previous Post Smoked Sea Trout…and the end of summer..or is it!? Next Post Chicken Vindaloo, the reason I cook and how she made it happen….